"Keep your head when others around you are losing theirs." It's sound advice for the crisis communicator, but easier said than done. The secret is preparation. Start with a thorough crisis vulnerability audit covering your company's operations, products and people. Then develop a detailed crisis communications plan with variations included for each significantly different type of crisis envisioned by the audit. Then remember that the actual crisis that strikes won't be at all like any of the scenarios you envisioned. A crisis creates a whole string of moments requiring on-the-spot good judgment from the person leading crisis communications. But you'll be much more ready to exercise good judgment and a steady hand if you have previously taken the time to develop your crisis plan. 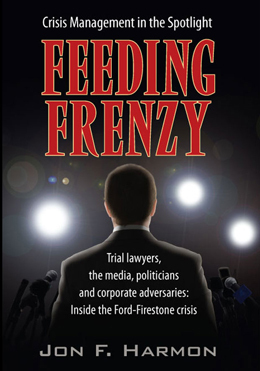 If you have little media-relations experience handling combustible issues and preparing for an all-out corporate crisis seems over-whelming, you'll do well to read Judith Hoffman's concise and well-reasoned Keeping COOL on the HOT Seat: Dealing Effectively with the Media in Times of Crisis. Just released as a revised fifth edition, this handy paperback provides wise counsel to the communicator that is both up-to-date and timeless. The beauty of this book is its simplicity. Hoffman breaks down the daunting specter of a crisis--and the role of a crisis communicator in confronting it--into a series of short, easy-to-understand mini-chapters that collectively can help a novice make sense of it all. Yet a more seasoned public relations pro will also find it to be valuable because it's all so spot-on. Act calm (keep your cool). She advises against trying to be "cute or clever" and to avoid the always deadly "No comment." This is all great advice and it's a solid reminder of the basics of crisis communications. Those who read and abide by the principles in this book will better serve their organization in the sudden event of a crisis. What's missing is exactly where I began this post--the crisis audit. Hoffman skips over the need to dissect the organization for vulnerability on various fronts. Often, the crisis audit will detect deficiencies that, once addressed, may help an organization avoid a crisis in the first place. And different types of vulnerabilities may require somewhat different crisis plans (for example, an explosion in a plant will require a different response plan than would a string of complaints of sexual harassment). Hoffman's book alone won't prepare a novice communicator for any emergency, but Keeping Cool readers will be far better off in an emergency for having read her book. "To get a true sense of what it is like to be on the "hot seat" in the midst of a raging crisis with national and international attention, read this book. Mr. Harmon was the head of Pubic Relations for Ford Truck in 1999 when this high-profile case broke. If there is even a possibility that your organization could be in such a high visibility position with your products deemed a safety threat to a large population, you owe it your self to know how these things work." New-look Force for Good website is now up! BP keeps paying through the nose, but will the public stop holding its nose at BP? If even Joe Pa couldn't resist pressure to cover up an ugly scandal, are we sure we would have done better? At too-big-to-fail banks, transparency should mean letting us know when risk models scream TILT! How can Facebook and JP Morgan win back your trust?